Hoang-Phuong Phan*, Yasuo Kitagawa and Tomoaki Niimi. Laminin (LM) α, β, and γ chains were connected by disulfide bonds at the C- and N-termini of the LM coiled-coil (LCC) domain to form heterodimers and heterotrimers. At the C-terminus of LCC domain, one disulfide bond is formed to connect β and γ chains while it was unclear how disulfide bond pattern is formed to connect α, β, and γ chains at the N-terminus of LCC domain. Using an insect cell-free translation system, we succeeded to produce heterotrimers of LCC domain of human LM-332. To analyze disulfide bond formation at the N-terminus of LCC domain, we mutated cysteines of LCC domains into alanines by site-directed mutagenesis and co-expressed these mutants in an insect cell-free translation system. Mutation of a single cysteine at the N-terminus of LCC domain of one chain caused the failure of disulfide bond formation of heterotrimers. However, mutation of cysteines at the N-terminus of LCC domain of two different chains recovered the disulfide bond formation of heterotrimers with different efficiencies. 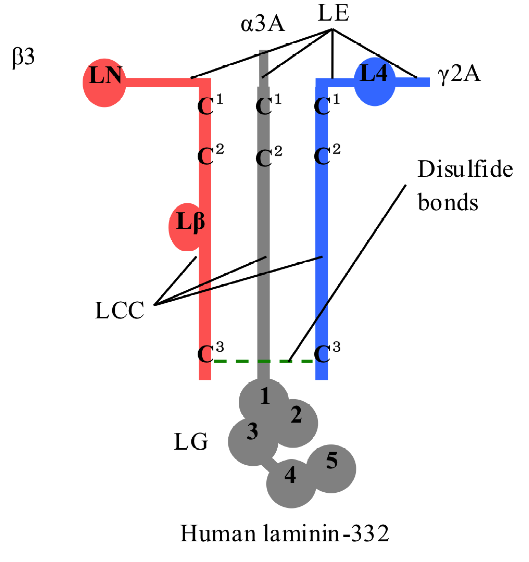 These results suggest that the disulfide bond patterns at the N-terminus of human LM-332 LCC domains are not specific. Abbreviations: EHS: Engelbreth-Holm-Swarm, ECM: extracellular matrix, BM: basement membrane, LCC: laminin coiled-coil, rER: rough endoplasmic reticulum. Laminins (LM) are large multidomain glycoproteins of the extracellular matrix (ECM). LMs and type IV collagen, nidogen, perlecan, agrin are major components of basement membranes (BM) that act as supportive architecture for the cells to proliferate, differentiate, and migrate. Each LM molecule is a 500 to 900 kDa heterotrimeric glycoprotein, in which α, β, and γ chains are assembled and disulfide bonded in a cross shaped structure with three short arms and one rodlike long arm (1-4). Since the first purification of LM-111 from mouse Engelbreth-Holm-Swarm (EHS) sarcoma (5), five a, three b, and three g chains have been recognized to combine into 16 different heterotrimeric LMs (6). The LM coiled-coil (LCC) domain is the site of trimer assembly. It has many repeats of the heptad motif where hydrophobic residues are located in the first and fourth positions and charged residues in the fifth and seventh positions (7-9). They form a hydrophobic surface along α-helix with ionic edges at both sides. Interchain hydrophobic interactions at this surface drive the chain assembly and ionic interactions at the edges determine the chain selectivity (10). Many studies of LM trimer assembly confirmed that β and γ chains first form β-γ heterodimer with disulfide bonds. Then, α chain assembles with β-γ heterodimer to form α-β-γ heterotrimer with disulfide bonds (11-14). Two cysteine residues (-C-X-X-C- motif) at the N-terminus and one cysteine residue at the C-terminus of LCC domains involve in disulfide bond formation of β-γ heterodimers and α-β-γ heterotrimers (2, 12, 15-17). Up to now, we do not know exactly which cysteine forms disulfide bond with which cysteine at the N-terminus of LCC domains. In our previous study, we succeeded to produce heterotrimers of LCC domain of human LM-332 (α3β3γ2) in an insect cell-free translation system (17). In this study, we mutated cysteine residues at the N- and C-termini of the LCC domains of human LM-332 into alanine residues by site-directed mutagenesis and co-expressed these mutants to analyze the role of these cysteine residues for LM heterotrimer formation with disulfide bonds in vitro (Fig. 1). The results showed that disulfide bonds at the N-terminus of heterotrimers of LCC domains could not form when we mutated only a single cysteine residue at the N-terminus of LCC domain of one chain into alanine residue. But the disulfide bonds could form with different efficiencies when we mutated cysteine residues at the N-terminus of LCC domain of two different chains into alanine residues. These results suggest that there is no fixed disulfide bond pattern among six cysteine residues at the N-terminus of LCC domains of human LM-332 heterotrimers. Fig. 1. Model of human LM-332 heterotrimer. Human LM-332 consists of α3, β3, and γ2 chains; α3 chain has an LM epidermal growth factor-like (LEc1-4) domain, an LM coiled-coil (LCC) domain, and an LM globular (LG1-5) domain; β3 chain has an LM N-terminal (LN) domain, an LEa1-3 domain, an LEb1-3 domain, an LCC domain, and an LM β knob (Lβ) domain; γ2 chain has an LEa1-3 domain, an LM 4 (L4) domain, an LEb1-3 domain, and an LCC domain. LCC domains of α3, β3, and γ2 chains assemble to form heterotrimers by disulfide bonds at the N- and C-termini. The drawing is to show that the disulfide bonds exist but does not imply their specificity. We had cloned the LCC domains of human LM α3, β3, and γ2 chains into pTD1 vectors as previously described (17-20). We used these vectors as templates for site-directed mutagenesis using GeneTailor site-directed mutagenesis kit (Invitrogen, Carlsbad, CA). We designed primers as shown in Table I. Mutated plasmids were checked by sequencing with an ABI Prism 310 genetic analyzer (Applied Biosystems, Foster City, CA). The mutated LCC domains were named by adding their mutated cysteine residues C1, C2, and C3 into their names. Thus, single mutations of LCC domains were named as α3C1, α3C2, β3C1, β3C2, β3C3, γ2C1, γ2C2, and γ2C3 while double mutations were named as β3C1C2, β3C1C3, β3C2C3, and γ2C2C3. One special mutant of the α3 LCC domain was made by substituting valine residue Val217 of α3C2 mutant with a cysteine. This special mutant was named as α3C* (Fig. 2). Fig. 2. Summary of LCC domains of human LM-332 and their mutants used in this study. 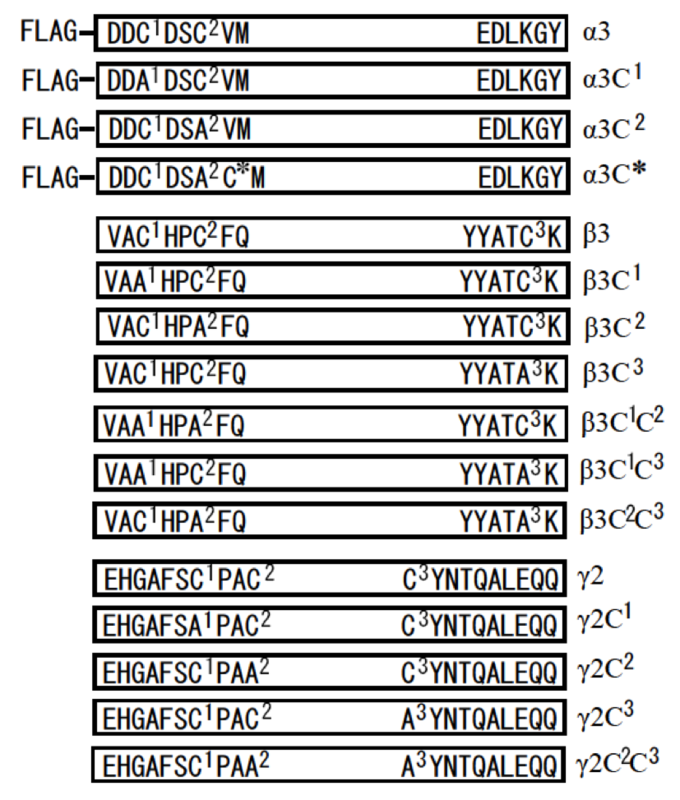 A FLAG tag was inserted at the N-terminus of LCC domain of α3 chain. A part of amino acid sequences from the N- and C-termini of LCC domains and their mutants were showed in boxes. Two cysteine residues at the N-terminus (-C1-X-X-C2-) and one cysteine residue at the C-terminus (C3) of LCC domains were mutated into alanine residues (A) by site-directed mutagenesis. The mutants were named by adding their mutated cysteine residues (C1, C2, and C3) into their names. One special mutant, α3C*, was created from α3C2 by mutating the valine residue that is adjacent to the alanine residue into cysteine. In this study, we called α3C1, α3C2, β3C1, β3C2, β3C3, γ2C1, γ2C2, and γ2C3 as single cysteine mutants, and β3C1C2, β3C1C3, β3C2C3, and γ2C2C3 as double cysteine mutants. mRNAs were synthesized from 1 μg of the linearized vectors using a ScriptMax Thermo T7 Transcription Kit (Toyobo, Osaka, Japan). The synthesized mRNAs were diluted to a final concentration of 2 μg/μl with nuclease-free water. Ethylenediaminetetraacetic acid (EDTA) was added to a final concentration of 1 mM. Protein synthesis was carried out using a Transdirect insect cell kit (Shimadzu, Kyoto, Japan) in non-reducing conditions. To check the heterodimer and heterotrimer formation, 6 μg of mRNAs of each α3, β3, and γ2 LCC domains and their mutants were mixed with other reagents of the kit to reach 50 μl of reaction volume following instruction (21-23). The reaction mixtures were incubated for 5 h at 25 oC. PProtein samples were separated on 8% sodium dodecyl sulphate (SDS) polyacrylamide gels under reducing or non-reducing conditions, and transferred onto HybondTM-ECL membranes (GE Healthcare, Piscataway, NJ). Membranes were blocked with 5% non-fat dry milk in phosphate buffer saline (PBS) buffer containing 0.1% Tween-20 (blocking buffer) for an hour at room temperature. Next, the membranes were incubated with primary antibodies against FLAG-tag (1:2,000) (monoclonal anti-FLAG M2; Sigma, St. Louis, MO), against LM β3 (1:2,000) (polyclonal antibody H-300; Santa Cruz Biotechnology, Santa Cruz, CA), against LM γ2 (1:2,000) (monoclonal antibody B-2; Santa Cruz Biotechnology) in blocking buffer for 1 hour at room temperature. Membranes were washed with PBS buffer containing 0.1% Tween-20 (washing buffer), and incubated with horseradish peroxidase-conjugated secondary antibodies (1:1,000) (GE Healthcare) in blocking buffer for 1 hour at room temperature. Membranes were washed again in washing buffer and developed using ECL western blotting detection reagents (GE Healthcare), and visualized on Hyperfilm MP (GE Healthcare). One cysteine residue at the C-terminus of β and γ LCC domains and two cysteine residues at the N-terminus of α, β, and γ LCC domains are necessary for disulfide bond formation of LM heterodimer and heterotrimer (2). These cysteine residues are Cys213 and Cys216 at the N-terminus of α3 LCC; Cys581 and Cys584 at the N-terminus and Cys1177 at the C-terminus of β3 LCC; Cys609 and Cys612 at the N-terminus and Cys1190 at the C-terminus of γ2 chain. To explain our data easily, we called Cys213 and Cys216 of the α3 chain, Cys581 and Cys584 of the β3 chain, Cys609 and Cys612 of the γ2 chain as C1 and C2 of the corresponding chains, respectively. We also called Cys1177 of the β3 chain and Cys1190 of the γ2 chain as C3 of the β3 chain and C3 of the γ2 chain (Fig. 1). We created single cysteine mutations of LCC domains including α3C1, α3C2, α3C*, β3C1, β3C2, β3C3, γ2C1, γ2C2, and γ2C3. We also created double cysteine mutations of LCC domains including β3C1C2, β3C1C3, β3C2C3, and γ2C2C3 (Fig. 2). We co-expressed these mutated α3, β3, and γ2 LCC domains with normal α3, β3, and γ2 LCC domains in different combinations to check for disulfide bond formation of heterodimers and heterotrimers. First, we investigated the roles of two cysteine residues, C1 and C2, at the N-terminus and one cysteine residue, C3, at the C-terminus of β3 and γ2 LCC domains for disulfide bond formation of β3-γ2 heterodimer. Many experiments confirmed that LM β and γ chains form a disulfide bond with cysteine C3 at the C-terminus of LCC domains (7, 11, 15). However, cysteines C1 and C2 at the N-terminus of LCC domain of β and γ chains have not been reported to form disulfide bonds. We co-expressed β3 or β3C3, β3C1C2, β3C1C3, and β3C2C3 with γ2 or γ2C3, γ2C1, and γ2C2C3 to examine if disulfide bonds by cysteines C1 and C2 at the N-terminus can be formed in the absence of cysteine C3 at the C-terminus LCC domains. We also examined which cysteine of β3 LCC binds to which cysteine of γ2 LCC at the N-terminus in the case β3 and γ2 LCCs can form disulfide bonds at the N-terminus. Western blotting using anti-β3 antibody showed that when β3 and γ2 LCCs did not have cysteine C3 at the C-terminus, heterodimer could not form disulfide bond by cysteine C1 and C2 at the N-terminus (Fig. 3). Western blotting using anti-γ2 antibody showed the same results (data not shown). Therefore, the disulfide bond of cysteines C3 at the C-terminus of LCC domain of β3 and γ2 chains is crucial for β3-γ2 heterodimer formation without α3 LCC domain; in the absence of cysteine C3, disulfide bonds of cysteines C1 and C2 at the N-terminus of LCC domains did not form. Fig. 3. The role of cysteine residues C1, C2, and C3 of LCC domains of β3 and γ2 chains for disulfide bond formation of β3-γ2　heterodimer. Mutants of β3 chain (β3, β3C3, β3C1C2, β3C1C3, and β3C2C3) were co-expressed with mutants of γ2 chain (γ2, γ2C3, γ2C1, and γ2C2C3). Samples were applied into 8% SDS-PAGE, in non-reducing condition and immunobloted with an anti-β3 antibody. The results showed that only when both LCC domains of β3 and γ2 chains have cysteine C3 at the C-terminus, β3-γ2 heterodimers could be formed (lanes 1 and 3 of β3 and β3C1C2). Molecular weight markers are indicated on the left. Monomer (m) and dimer (d) bands are indicated with black triangles. To check for disulfide bond formation by cysteines C1 and C2 at the N-terminus of LCC domains, we co-expressed LCC domain of α3 chain with β3C3 and γ2C3 mutants which do not have cysteine C3 at the C-terminus but intact cysteines C1 and C2 at the N-terminus. Western blotting using anti-FLAG antibody showed that β3C3 and γ2C3 mutants could form heterotrimers with disulfide bonds normally (Fig. 4A). Western blotting using anti-β3 antibody and anti-γ2 antibody showed the similar results (data not shown). Therefore, without disulfide bond at C-terminus of LCC domain of β3 and γ2 chains, α3-β3-γ2 heterotrimer could form disulfide bonds by cysteines C1 and C2 at the N-terminus of LCC domains. Next, we examined whether the position of cysteine residues C1 and C2 at the N-terminus of LCC domains affects disulfide bond formation of heterotrimer. Cysteines C1 and C2 at the N-terminus of LCC domains usually have -C1-X-X-C2- motif, except α1 and α2 chains, which have –C1-X-X-X-C2- motif (24, 25). We made α3C* mutant which has the -C1-X-X-A-C*- motif instead of the -C1-X-X-C2- motif. Therefore, the position of cysteine C2 was moved 1.5 angstrom far from C1. The results using α3C* mutant showed that heterotrimer could form disulfide bonds normally by cysteine residues C1 and C* at the N-terminus of α3C* LCC domains with β3C3 and γ2C3 mutants (Fig. 4B). This result suggested that interaction of α3 chains with β3-γ2 heterodimers at the N-terminus of LCC domains is not rigid but flexible. Fig. 4. Disulfide bond formation of α3-β3-γ2 heterotrimer with cysteines C1 and C2 at the N-termini of LCC domains. LCC domains of α3, β3, and γ2 chains and their mutants (α3C*, β3C3, and γ2C3) were co-expressed and checked for disulfide bond formation at the N-terminus. Expression samples were applied into 8% SDS-PAGE in non-reducing condition and detected by western blot with anti-FLAG antibody. A, LCC domains of α3 chain could form disulfide bonds with β3C3 and γ2C3 mutants at the N-terminus. B, α3C* mutant which has the –C-X-X-X-C- motif at the N-terminus could form disulfide bonds with β3C3 and γ2C3 mutants at the N-terminus. Molecular weight markers are indicated on the left. Monomer (m) and trimer (t) bands are indicated black triangles. The bands indicated with white triangles are thought to be non-specific bands. We co-expressed one single cysteine mutant among α3C1, α3C2, β3C1, β3C2, γ2C1, or γ2C2 with two normal LCC domains of α3, β3, or γ2 chains to check for disulfide bond formation of heterotrimer. 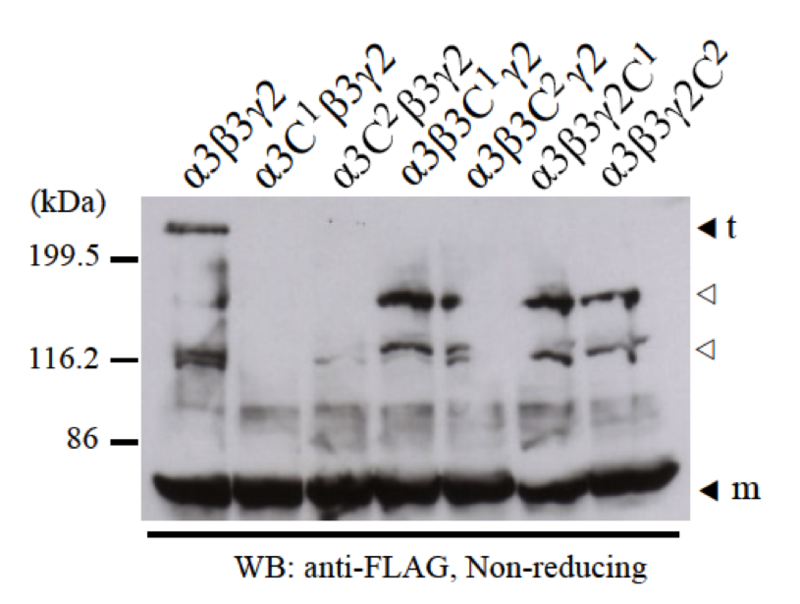 Using anti-FLAG antibody for western blotting, we did not detect any heterotrimer bands (Fig. 5). However, when using anti-β3 antibody or anti-γ2 antibody, we could detect very little amount of some heterotrimer bands with different size and migration (data not shown). By immunoprecipitation using anti-FLAG antibody, we could also detect the presence of β3 and γ2 chains using anti-β3 antibody and anti-γ2 antibody (data not shown). It means all the mutants interacted and assembled into dimer and trimer normally. Fig. 5. The failure of disulfide bond formation by a single mutation of cysteines C1 and C2 at the N-terminus of LCC domains. Two normal LCC domains of α3, β3, and γ2 with one of the single cysteine mutants (α3C1, α3C2, β3C1, β3C2, γ2C1, and γ2C2) were separately co-expressed and checked for heterotrimer formation by disulfide bonds at the N-termini. Samples were applied into 8% SDS-PAGE in non-reducing condition and detected by western blot with anti-FLAG antibody. The results showed that without one cysteine C1 or C2 at the N-terminus of LCC domains of α3, β3, and γ2 chains, α3-β3-γ2 heterotrimers could not form. Molecular weight markers are indicated on the left. Monomer (m) and trimer (t) bands are indicated black triangles. The bands indicated with white triangles are thought to be non-specific bands. We then co-expressed two single cysteine mutants among α3C1, α3C2, β3C1, β3C2, γ2C1, or γ2C2 with one normal LCC domain of α3, β3, or γ2 chains to check for the disulfide bond formation of heterotrimer. The results showed that some mutant combinations such as α3-β3C1-γ2C1, α3C1-β3C1-γ2, α3C1-β3-γ2C1, and α3C2-β3-γ2C1 have weak efficiency of heterotrimer formation. Some other mutant combinations such as α3-β3C2-γ2C1, α3-β3C2-γ2C2, α3C1-β3-γ2C2, α3C2-β3C1-γ2, α3C2-β3C2-γ2, and α3C2-β3-γ2C2 showed normal heterotrimer formation. But two special combinations of α3-β3C1-γ2C2 and α3C1-β3C2-γ2 showed the failure of heterotrimer formation with disulfide bonds (Fig. 6). With three antibodies against α3, β3, and γ2 chains, we repeated this experiments several times and the results were same. We could not identify which cysteine binds specifically to which cysteine at the N-terminus of LCC domains of LM-332. These results suggested that there is no specific disulfide bond pattern for cysteines at the N-terminus of LCC domains of LM-332. Fig. 6. Disulfide bond formation of heterotrimers by two single mutations of cysteines C1 and C2 at the N-terminus of LCC domains. One normal LCC domain of α3, β3, or γ2 and two other single cysteine mutants among α3C1, α3C2, β3C1, β3C2, γ2C1, and γ2C2 were co-expressed and checked for heterotrimer formation by disulfide bonds at the N-termini. Samples were applied into 8% SDS-PAGE in non-reducing conditions. 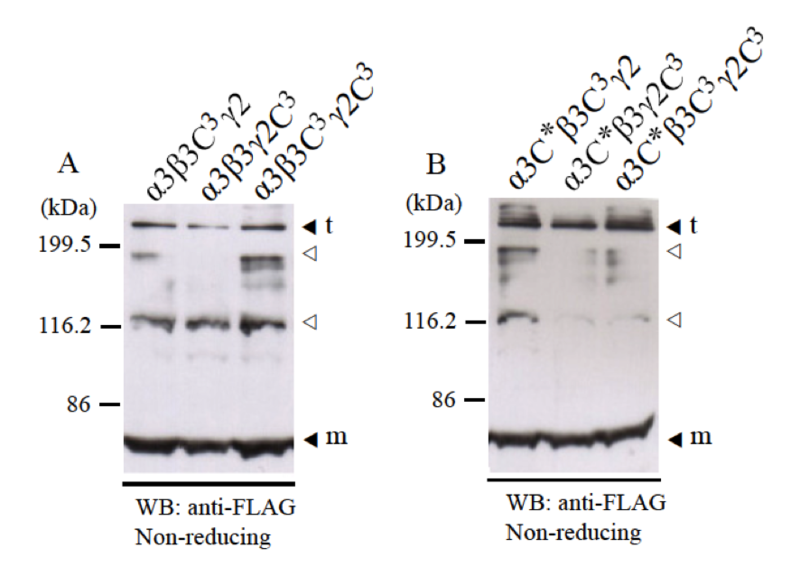 Western blot was first done with anti-FLAG antibody to detect α3 chains, then the membrane was stripped and reprobed with anti-β3 antibody to detect β3 chains, and finally stripped and reprobed again with anti-γ2 antibody to detect γ2 chains. The results showed that LM heterotrimers formed with different efficiencies depending on single cysteine mutant combinations. Cell-free translation system is a convenient system for recombinant protein expression and protein-protein interaction analysis. We succeeded to synthesize heterotrimers of LCC domains of LM-332 in cell-free translation system derived from Spodoptera frugiperda 21 (Sf21) insect cells (21-23). With the advantages of this system, we could analyze the disulfide bond formation of heterodimer and heterotrimer using many mutants. Our study focused on the disulfide bond formation of two cysteine residues C1 and C2 at the N-terminus and one cysteine residue C3 at the C-terminus of LCC domains, which involve in disulfide bond formation of LM heterodimer and heterotrimer. Our previous data showed that when we expressed monomers of LCC domain of α3, β3, or γ2 chains, LCC domain of β3 or γ2 chains could form homodimers except α3 chain, but not homotrimers. When we co-expressed LCC domain of β3 with γ2, the main product was β3-γ2 heterodimers with a little amount of homodimers. This suggested that β3-γ2 heterodimers are more preferably formed comparing with β3-β3 and γ2-γ2 homodimers. Interchain hydrophobic interactions and ionic interactions of α-helix coiled-coil domains drive the assembly of β3 and γ2 chains and that supports the disulfide bond formation by cysteines C3 at the C-termini. We did not find any trimers such as β3-β3-γ2, β3-β3-β3, γ2-γ2-β3, and γ2-γ2-γ2 when we co-expressed LCC domains of β3 with γ2. In this study, we mutated cysteines C3 at the C-termini of LCC domains of β3 and γ2 chains into alanines, we found that β3C3 and γ2C3 mutants could not form disulfide bonds by cysteines C1 and C2 at the N-termini. This result suggested that interchain interactions of LCC domains of β3 and γ2 at the N-terminus were not strong enough or incomplete to support for the disulfide bond formation. Therefore, interchain hydrophobic interactions and ionic interactions at the C-terminus of LCC domains will drive the chain selectivity of LM β and γ chains. Then, cysteine C3 as a first lock will fix all preferably formed β-γ heterodimers by a disulfide bond at the C-terminus of LCC domains. When α3 chain interacts with β3-γ2 heterodimer, the interaction of three chains at the N-terminus of LCC domains can make their cysteine residues come closer to each other and that interaction supports better for disulfide bond formation. The result using α3C* mutant, which has the -C-X-X-X-C- motif instead of the -C-X-X-C- motif showed that the α3C* mutant could form disulfide bonds normally with the β3C3 and γ2C3 mutants. This result suggested that interaction of α3 chains with β3-γ2 heterodimers at the N-terminus of LCC domains are flexible with more than one interacting site. So the existence of LM heterotrimers that do not have disulfide bonds at the N-terminus of LCC domains could be because α chains do not interact with β-γ heterodimers at the site suitable for disulfide bond formation (12). From this result we also suggest that β3-γ2 heterodimer may be able to form disulfide bonds in vitro with all other LM α chains by cysteines C1 and C2 at the N-terminus of LCC domains. Furthermore, to the best of our knowledge, this study is the first to show that without a disulfide bond at the C-termini of coiled-coil domain of β3-γ2 heterodimers, heterotrimers could be formed by disulfide bonds at the N-termini of coiled-coil domains. By using computer programs to analyze coiled-coil structure of all human and mouse LCC domains, Zimmerman and Blanco also concluded that it is possible for all LM α, β, and γ chains to form other non-natural disulfide-bonded heterotrimers out of 15 well-known natural LMs in vitro (26). Our data showed that cysteines C1 and C2 at the N-termini of LCC domains are necessary for disulfide bond formation of heterotrimers. We created six single cysteine mutants including α3C1, α3C2, β3C1, β3C2, γ2C1, and γ2C2, and co-expressed these mutants with normal LCC domains to analyze which cysteine binds specifically to which cysteine at the N-terminus of LCC domains of LM-332. When we co-expressed two normal LCC domains with one single cysteine mutant, disulfide bonds could not form at the N-terminus of LCC domains. But when we co-expressed one normal LCC domains with two single cysteine mutants, disulfide bonds could form again with different efficiencies depending on mutant combinations. Furthermore, when we co-expressed three single cysteine mutants, heterotrimer could not form again (data not shown). These results suggested that the disulfide bond formation by cysteine residues C1 and C2 at the N-terminus of LCC domains of LM-332 are not fixed but random with different efficiencies depending on which cysteine binds to which cysteine. There should have other factors that interfere or involve in the disulfide bond formation by binding to cysteine residues of LM chains. These factors could be any molecular chaperones involving in interchain and intrachain disulfide bond formation of proteins (27). Further researches are needed to understand the mechanism of disulfide bond formation of LM heterotrimers inside the cell. In conclusion, we provided new information about disulfide bond formation of LM heterodimer and heterotrimer. First, LM α, β, and γ chains are translated as monomers. Then, β and γ chains assemble to form β-γ heterodimers with a disulfide bond at the C-terminus of LCC domains. Next, α chain assembles with β-γ heterodimers. When α chains interact with β-γ heterodimers at suitable sites, disulfide bonds will form randomly at the N-terminus of LCC domains. Disulfide bond formation of heterotrimer at the N-termini does not depend on the disulfide bond formation at the C-termini of coiled-coil domains. We suggest that interactions at the N-terminus of LCC domains are important for disulfide bond formation of LM heterotrimers. This study was supported by a Grant-in-aid (no. 18108003) for Scientific Research from the Ministry of Education, Culture, Sports, Science, and Technology of Japan. HPP was supported by the Iwatani Naoji Foundation. We would like to sincerely thank Assoc. Prof. Tatsuhiko Kadowaki for his contribution in cloning laminin332 cDNA for this research. 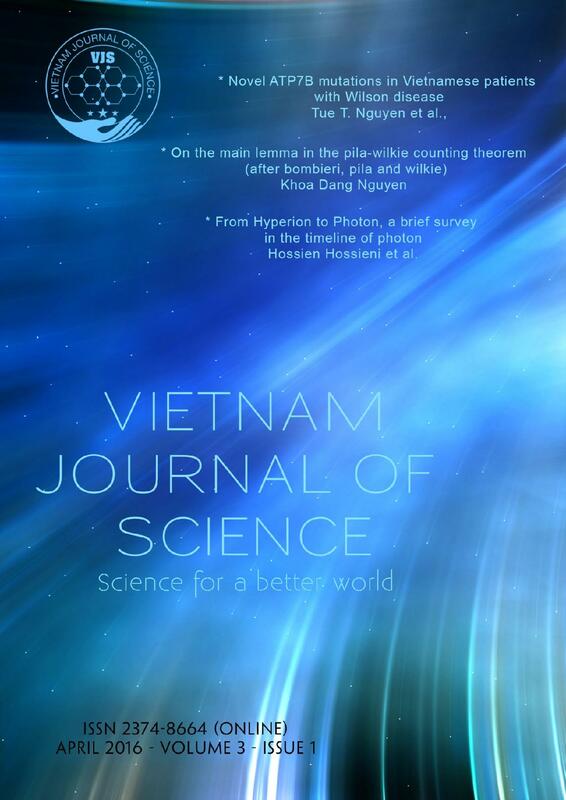 Dr. Phuong Phan received a Bachelor of Biotechnology from Vietnam National University at Hanoi, and then an MSc as well as a PhD in Bioengineering Sciences from Nagoya University, Japan. His research at Nagoya University was to develop an expression system to produce human laminin-332 at an industrial scale as well as to elucidate the assembly mechanism of this protein. He has gained many industrial experiences when working for companies in pharmaceutical industry and next generation sequencing technology in Japan. Professor Yasuo Kitagawa was a laminin guru professor at Nagoya Universiry; the late Professor Kitagawa passed away in 2007. Assistant professor Tomoaki Niimi is an expert of laminin; assistant professor Niimi currently focuses on studying the roles of Nel-like molecule 1 (NELL1) in cell adhesion and differentiation.